A 17-year-old wakes up in NYC with no memory of who he is or how he got there. All he has on him are 10 dollars and a worn copy of Walden by Henry David Thoreau-- so he becomes "Hank". After some disturbing evens take place on the streets of New York, Hank decides the book must be a clue and heads to Concord (the site of Walden Pond). Once there, he tries to blend in with the local teens, and even develops a crush on one of them. All the while he knows that the reason he can't remember anything about his former life is because of something bad. Something he did. When his life of the streets starts catching up with him, he comes across Thomas, a man who steps in to be a father figure when Hank needs it most. 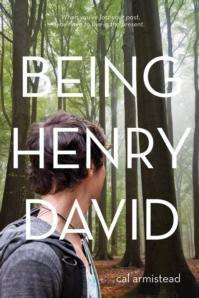 Thomas, a research librarian and Thoreau expert, shows Hand the way to find out who he really is and how to gradually open up his mind to what really happened before he became "Hank". I really enjoyed this book. What an awesome debut novel!! I was especially impressed by how smart and solid this book was. Thoreau was all about leaving society behind, living simply, and connecting with nature. His story really went with what Hank was going through. Hank's mind needed to clear itself and Concord was the the place he needed to go to do so, just like Thoreau. I love reading from male perspectives. Not sure why that is, but books like this one remind me that it's something I want to do more often. What really intrigued me about Hank was how he just went with his instincts. When he first wakes up without memory, he just has this feeling that he can't go to the police. It leads him to believe that maybe he was in trouble with the law somehow. Then he's off to Concord to follow the clue of the book and from there he just goes with things. The nod to Thoreau was just right for me. It wasn't a re-telling, Hank just looked to Walden for guidance and inspiration. The mystery of who Hank is and what was so horrible that his mind wouldn't let him remember had me hooked. I just HAD to know where he came from. I knew it was going to screw everything up that he had going in Concord, but I really wanted him to know. Even if he found out he was a bad person in his real life. It was cool getting to know and like someone who you really weren't sure what they were capable of. Were we going to find out that Hank was some kind of criminal? I wasn't sure, but I liked the duality of liking someone, but not knowing if I should. I don't want to give away the ending or anything, but I just want to say that I loved it! It was really beautiful. The author didn't spell out everything that's going to happen in the future and normally I would be upset by that... but not in this case. It gave a nod to the closing line in Walden which ends at the dawn of a new day, and I took that as this was a new beginning for Hank, a new chapter. And I took it as hopeful. I like it when the author gives the reader credit that they can infer some things without everything just being there in black and white. But don't get me wrong, it is a delicate balance. I can't stand abrupt endings that give no inferences. This one is not like that. The only thing I didn't love was that Hank has a few convo's with Thoreau's ghost that left me a little confused. Was that his mind just telling him he wasn't ready to remember? I wasn't really sure... but it was weird. And there's also this part where Hank finds out he knows how to play guitar and all of a sudden he starts using the word "rockin" a little too much for my taste! "I'm this pretty white bird like a dove or something, who escapes from from it's cage and has to learn to fly all over again because she forgot how, get it?" "I hold the moment like it's a paper-winged butterfly, unable to believe the fragile truth of it." Perhaps it is because he hears a different drummer. Let him step to the music which he hears, however measured, or far away." Overall: Wow! A really great debut novel for Cal Armistead. I recommend this book for anyone who wants to go on an adventure and teens who are looking to find themselves. A super-cool refreshing contemporary YA. How I got this book: Thanks to Netgalley and Albert Whitman & Co. I definitely enjoyed this one too. A pretty solid coming of age story and yes, it was definitely the mystery that first captured my attention. this is next on my list to read and I can't wait. I've been joking with the author that her character and mine (who recites Walt Whitman) should go out for a slice of pizza. I haven't heard of this book - sounds really good! I, too, love YA books from the male perspective. I look forward to reading this.